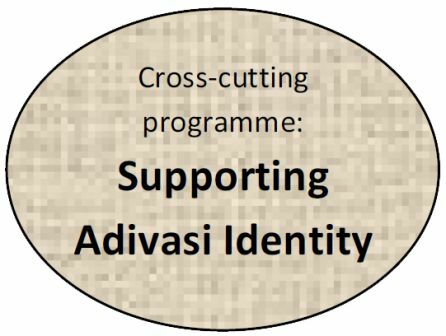 Undertake activities which make learning accessible and relevant to adivasi children, acting upon the idea that if education is to be meaningful to adivasi children, then education processes also need to change to accommodate them. Promote first language learning for younger children and connect language and culture with education for older children. Research, develop and produce first language learning materials in Kora and Santali for use within Suchana’s education programmes as well as for local distribution to schools, households and adivasi organisations. Starting in 2009, Suchana has gradually developed a series of books and small publications in Kora and Santali, using the Bangla script which the children learn in school. Most books make up part of the developing series ‘Amar Bhashai Amar Boi’ (my books in my language). We started thinking about writing a Kora book because there was no Kora book or alphabet primer of this kind in the past. So the Kora children, who are the majority at Suchana, suffered from this disadvantage. Suchana felt that if these children can learn in their Kora language instead of Bengali it would be better for them. If we could write a Kora alphabet primer then it would benefit Suchana as well as Kora society in general. When I started writing it, I was very happy. But then I began to feel some pressure because, since this was the first Kora primer, I wanted it to be correct and good. Sometimes this made me hesitant; it seemed a lot of responsibility. During these times I thought this is the first time I am writing a Kora book and it will also be the last. It took more that a year to write the book. I asked for help from some senior Kora people. Gopal Saha, Suchana’s art teacher, drew all the pictures. When the writing and pictures were all finished I felt so happy and proud of myself, so I really want to thank Suchana for giving me the opportunity to write this book. So the Kora children have got their first Kora alphabet primer with nice pictures, and they are very happy. When I or someone else reads to them from this book, the children really enjoy it. When I use the book in class, I feel very proud to have done this. I have also noticed that other Kora children and adults, from outside Suchana, also want to see the book, and are happy to listen to the poems.